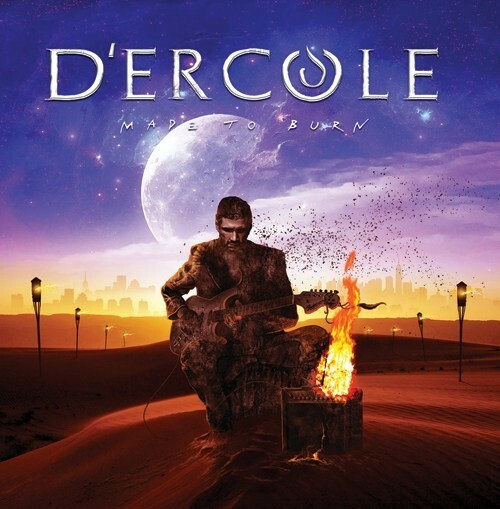 'Made To Burn' is the fifth album from D'Ercole – the collaboration between multi-instrumentalist/vocalist Phil Vincent and guitarist Damian D'Ercole. I have a lot of respect for Vincent and his song-writing, and I tend to really enjoy the vast majority of his songs and appreciate his vocals. The D'Ercole albums stand up to the quality of his other bands and solo work with this opus being no exception. If you're already a fan of the band, or indeed anything involving Vincent, then this will definitely please you. I enjoyed the album on my casual first listen, but felt it wasn't as impressive as some of Vincent's other recent output. When I returned to the album for a proper listen as I started my review, I found the songs more intriguing than my first impression implied, and with further multiple spins, I then found the songs really getting under my skin. It didn't take too long for it to really start impressing me; this is definitely one of Vincent's strongest albums to date and maybe the best D'Ercole have produced hitherto. As you've come to expect from any of Vincent's releases, he's not afraid to mix it up and offer some variation with his songs. The ever-present Beatles influence rears its head on album closer 'Don't Know What You've Got', albeit in a slightly less prominent way than I've heard before. Here the main mix is between full-bloodied hard rockers and songs with strong, early AOR touches along the lines of Chicago and other piano-led bands from that era. These softer songs are accompanied by raw-edged guitars which modernise the impact and beefs up the sound in a harder direction as some of these songs could just as easily be recorded as Pop songs given the strength of the melodies. Vincent puts in a really strong vocal performance on this album and 'Time To Walk Away' is a prime example of his voice at its best. I also enjoyed the raw and prominent guitars which give these songs a D'Ercole stamp and identity. The album's standout tracks are 'Feel The Burn', which has an insistent chorus and really gets under your skin, and the powerful and immediate rocker 'Time To Walk Away' as well as the early AOR sounding duo of 'Out Of Time' and 'Open Your Eyes'.